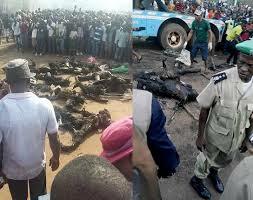 The Anambra State Sector Command of the Federal Road Safety Corps (FRSC) said on Tuesday that 45 lives were lost in Sunday’s tanker fire at Upper Iweka, Onitsha, Anambra State. The Sector Commander, Mr Sunday Ajayi, who confirmed the figure in an interview with the News Agency of Nigeria (NAN) in Awka, the state capital, said that six persons were rescued and were recuperating. Ajayi said that a total of 20 automobiles, including 16 motor vehicles, three tricycles and a motorcycle were burnt in the inferno. He bemoaned the enormity of the accident and attributed it to brake failure, adding that information was limited and sketchy as most eyewitnesses were also victims. He commended his men and staff of other agencies who responded to the call for rescue operations which minimised the damage. "From the official record we have, 45 persons died in that ugly incident and six people were rescued and are now receiving treatment. We understand the emotions of the people as a result of that fire and people are bound to make projections according to their feelings. "It is painful because human beings are involved but that is the record of victims that we have ascertained," he said. The sector commander, however, criticised the conversion of accident-prone spaces to motor parks, saying the area was not ideal for safe traffic. He called for urgent relocation of such parks as well as a total ban on any form of trading on expressways in the state. Ajayi said that if people were not encouraged to loiter around the area, the number of casualties would have reduced. "It's not ideal to use such places as motor parks. We advise the state government to relocate those Upper Iweka parks and beautify the area with flowers. "The government should also enforce the ban on trading on the expressways. We do not wish to have such carnage again," he said.